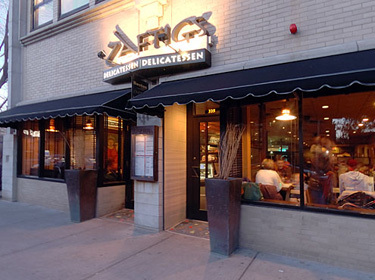 Zaftigs is as close as you'll get in Boston to the traditional Jewish deli experience. Save yourself the trip to New York and head to Brookline for great sandwiches, gefilte fish, chopped liver and other classics. Zaftigs is also the place to go for breakfast - any time of day. Located in Coolidge Corner in Brookline, there are public parking lots available and convenient parking available using meters along Harvard Street. Our complete menu is available for take out and most menu items can be prepared to meet your dietary needs.